It would appear former Red Sox closer Jonathan Papelbon is starting to channel the spirit of Rickey Henderson, the current reigning champion of speaking of one’s self in the third person. Either that or he has basically completely lost it. On Wednesday Papelbon sat in for a scheduled Boston station radio interview. He made some, well, interesting comments. Enjoy the pick of the bunch, below. "The previous trainer there tried to tell me everything and that he knew everything about me. It's just not the case. I know myself. I know how to get through a 162-game season. The trainer don't know how to do that and the trainers here (in Philadelphia) have been phenomenal. They understand that I am going to be successful because I know how to be successful. I still did things my way when I was there in Boston. I just had someone chirping in my ear the whole time." Did you feel (bad) about leaving the Red Sox after the chaos of the collapse last September? "I don't feel bad. No. Cinco is gutless man. I don't feel bad for people." On his ability and confidence to close? "I am confident in my ability and ain't nobody going to tell me what to do. Nobody tells Cinco what to do." Nobody puts Papelbon in a corner! 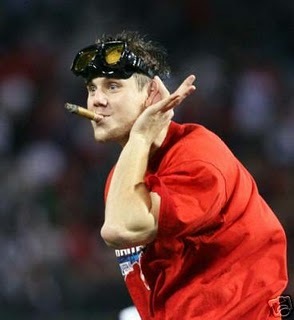 One thing does have to be said, Papelbon is fiercely loyal to his former team mates in Boston. What did you think of the Red Sox clubhouse? Does it need to be blown up after what you saw last year? "That starting staff is some professional pitchers man. I don't care who you are in the big leagues. You are going to go through rough patches, especially in that division, but the thing is that personally I would want those guys to go to war with to go through those rough patches cause they know how to get out of it. There is no doubt about that."